We will also make custom arrangements for your outdoor pots, your mantel, even your mailbox. Stop by the store to find out more. Artificial wreaths, garland, mantel swags – decorated, undecorated, and pre-lit. 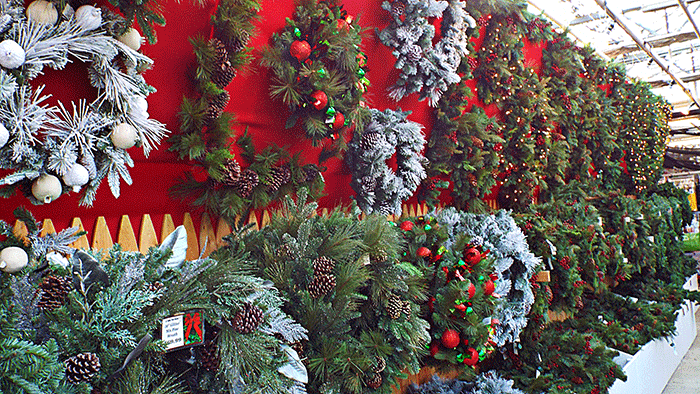 Also, popular now are battery operated wreaths and garlands for indoor/poutdoor use with built in timers. Choose from a variety of styles. Valley View Farms has everything you need to make your Christmas bright including electric and battery-operated light sets and window candles, LED light sets, replacement bulbs, solar Christmas light stakes, illuminated Christmas figures, and much more.